The Washington Nationals may have disappointed a few fans last year, but at least their stadium’s a winner. Nationals Park was the country’s first major league ballpark to be certified under the LEED green building rating system. With the new season around the corner, the Nats have a fresh start – and you have another chance to take a look at the small placards throughout the stadium pointing out its green features. For example, efficient lighting uses 21% less energy than typical field lights and water-conserving plumbing fixtures use 30% less water, saving enough each year to fill five and a half Olympic-sized swimming pools. Recycled materials were used in construction, and 5,500 tons of construction waste was recycled rather than dumped in a landfill. The park has a 6,300 square foot green roof, and other areas of the roof use highly reflective materials – both features minimize heat gain, which you’ll appreciate on a scorching hot August day at the park. A unique water filtration system prevents debris and pollutants from entering the sewer system, which is good news for the Anacostia River. The stadium also earns green points for redeveloping a brownfield and being close to public transportation. 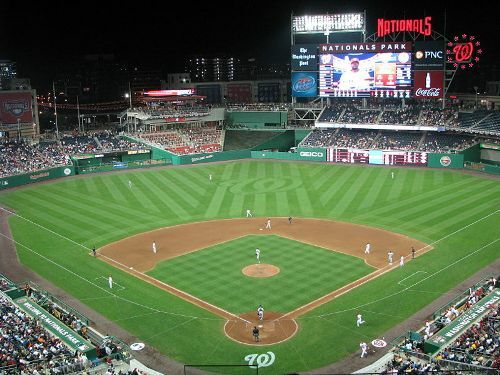 To top it all off, in 2008 the DC Sports and Entertainment Commission offset 70% of the electricity use at Nationals Park with a purchase of renewable energy credits. Across all sports and at all levels of play, other facilities are following suit. A search of the U.S. Green Building Council’s list of LEED-registered projects reveals more than 30 stadiums, arenas, and ballparks that high schools, universities, and professional teams around the country are looking to get certified. Nationals Park led the way in adapting the LEED rating system – more commonly used for office buildings and schools – to the very unique needs of a professional sports facility. Sustainably speaking, at least, the Nats have hit a home run.